How much does it cost to screen council meetings? THE public gallery was virtually empty again at last Thursday’s full council meeting. Why? We regularly hear of the good old days when the public benches were full of raucous hecklers and community campaigners. Where has everybody gone? 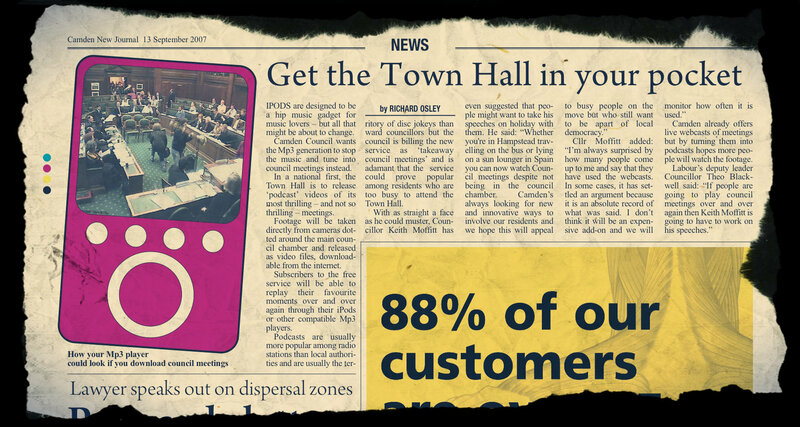 The lack of public interest could mean that everybody in Camden is so satisfied with what our elected members are doing that they don’t feel the need to try and speak in front of councillors or listen to what they have to say. Or maybe the drab ‘you’re bad, no you’re bad’ political point-scoring became so boring that the people of Camden decided to watch the Leyton Orient versus Brentford match on Sky on Thursday night instead. Or maybe the empty seats deceive us and there is a great interest but people are simply watching along on the live council website webcast instead of turning up to see our local politicians in the flesh. It would be interesting to see how many people logged on. The overseas branches of the Roger Robinson fanclub, who love his angry speeches about Rachmanite landlords, will depend on it. The sound and sight of Dynamite Don Williams in full flow meanwhile should surely be considered as a ‘pay per view’ option. Webcasting is obviously a helpful service to journalists so you won’t catch me moaning and should any councillor ever say anything really controversial or meaningful then their views are ‘on record’ in the clearest terms – a good thing. But grumblers from places like the Tax-Payers Alliance might compare the viewing figures with the cost. Here’s the first half of that equation for them. Emails exchanged about the cost of webcasting suggest one session costs £70. HS2 campaigners had wanted a recording of a meeting being held at Camden Council tonight to be made. The huge Italian audience logging on to watch the likes of Gio Spinella and Lazzaro Pietragnoli boss proceedings will think, like me, that is money well spent. 4 Comments on How much does it cost to screen council meetings? The big society could surely find a person to volunteer for such important matters where Euston the core of HS2 London is so confused between rail and property developments scopes. Suggest the reappraisal of HS2 along the M1/WCML route through Willesden/Wembly instead of the Old Oak Common route is discussed when there is a webcaster available. Webcasting the DCC Planning Committee meetings, for example, is invaluable in the Appeal process. And it was great to have captured the top speakers in last November’s joint event with Islington, the Air Quality Summit, for subsequent dissemination to those not able to be there. But Full Council, with empty galleries and without Ellen Luby heckling doesn’t have quite the same uncertainty – as, hopefully, people do watch at home. At £70 per session – it’s INCREDIBLY good value. Worth FAR more! Not least for the jokes at Jonny Bucknall’s expense in Full Council about him emulating The Shining’s mad axeman Jack Nicholson. It’s true that people seem to come to council meetings to complain/protest/lobby rather than out of a simple fascination for the town hall machinations – the people’s supermarket and the big statue protests are two recent lobbies that spring to mind. As it happen I watched online for the first time and surprised myself at how “into it” I got, particularly when one Conservative councillor tried to explain that rogue/slum landlordism was caused by *over* regulation – nice try, no cigar. I suspect though that the general decline in interest and engagement is down to the simple fact that people think (wrongly but understandably) that they don’t have influence, so they just let politicians get on with it. That’s dangerous and worrying I think. How committed is the council to really to being transparent and open to all? You only have to judge how poor its webcast is as a medium to know. You can’t access them with an Ipad or a mobile phone. You can’t download them to take with you to watch at your convenience. You can’t download a audio-only file. Basically, if you want to know what the Council is up to, you have to anchor yourself to a spot where the webcasts can be streamed. It’s time in this growing age of mass-personalisation, that the Council gets it act together and makes participation in local democracy a synch rather than a chore!